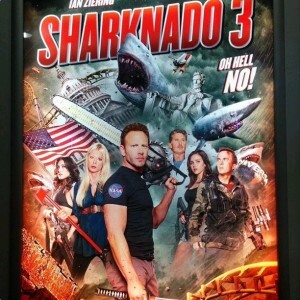 The Sharknado phenomenon again thrilled the world with Sharknado 3. Fans of B movies and fans that Sharknados’ are the only B movies they know of apparently have Sharknado 4 to look forward to. After the first Sharknado, The Asylum received a massive amount of national attention. The best thing about all the publicity was that it opened the eyes of big budget movie audiences that there are fun films out there that don’t require tens of millions of dollars and years to make. With the exception of Sharknado, when the Asylum announces a new film, they’re immediately on it and within several months the film is released. Sharknado takes a little longer to complete, probably because they are under the microscope to exceed the Sharknadoans expectations of the last Sharknado and you can’t accomplish that in three months. 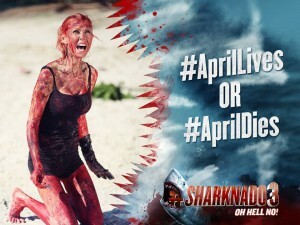 The Sharknado difficult challenges lie on the entire cast and crew, but predominantly on director Anthony C. Ferrante, writer Thunder Levin, and the entire VFX team headed up by Joseph Lawson and Emile Edwin Smith. The Asylum team with Sharknados’ 2 and 3 succeeded at the complicated task of cramming in dozens of cameos, nonstop comedic dialogue, tons of quality kills, and maintained the main plot and subplot within a short 90 minutes. It doesn’t stop there, you need to pay attention to subtle background visuals or dialogue. For example Lou Ferrigno saying “Don’t make me angry,” or did you see the three headed shark on the movie screen during the theatre scene? 3 Headed Shark Attack is another Asylum film by Chris Ray that just came out. Sharknados’ have to be watched numerous times to catch all cameos, background antics, and references. Prior to the airing of Sharknado 3, the war room in the Asylum’s office probably was hard at work already on Sharknado 4. For those Sharknado fans that have not seen another Syfy or Asylum film, do go to their website and scan through more than 300 films they have available. The list consists of all genres including, creature, disaster, horror, comedy, made for Lifetime, holiday films, found footage, and even children films. All DVD’s are available on their website, or you may find some streaming on Netflix and other VOD channels, or available at Redbox. Do not stop with just Asylum films, there are so many fun, action packed, goofy B Movies out there by some talented filmmakers that pour their heart and soul into their films. In addition to www.bmovienation.com, another site full of great information about B Movies is the Facebook page “Fans of Syfy Original Movies” and “Tuning into SciFi TV” website.